There are still some new titles from Tiger Tales' Spring 2013 line-up for me to share with you. (I shared some bear-themed books over at 5 Minutes for Books.) They just had a tremendous line-up of new titles this season (in my humble opinion). I wanted to take a minute to share my top two favorite from the stack. I Want My Mommy! Now come on. This one is designed for mommies everywhere to love. 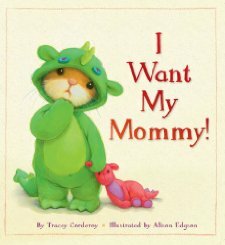 In this book by Tracey Corderoy we meet Arthur, an adorably cute little mouse who likes to play dragons. His mommy is going to take him on an adventure to Grandma's house. The problem is that as much as Arthur loves his grandma, he really dearly misses his mother. Grandma keeps assuring him that his mommy is coming back and eventually she distracts him from missing mommy so intently. However, he is awfully glad when Mommy comes home again. Seriously. Try to resist that book. 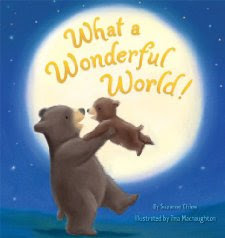 Then I sat down to read What a Wonderful World! , by Suzanne Chiew and am having a very difficult time containing my glee over this story. and placed on earth for us to share. We thank you, Lord, for the joy each brings. I tell you it is so refreshing to see a mainstream children's book publisher take up a title that is not just "religious" but focuses specifically on God as Creator of the universe. Each page in this book expresses that the Lord created this beautiful world that we live in and wants and desires for us to be amazed by it and to wonder in it. There is such a sense of JOY about this book as we see the mother and baby bear explore fields and streams and view the ocean. and know that You, Lord, made them all. In a world and a society that is becoming increasingly hostile to Christianity and who reject the idea of a Creator God, this book is very welcomed by me. I appreciate the courage it takes for a publishing company to pick up a title like this and I can only enjoy Tiger Tales more for their bravery in deciding to present a message that is a rather unpopular these days. For those of us who maintain a Christian worldview, it's nice to see a book honor our beliefs as well. Thank you! A huge and hearty thank you to Tiger Tales for publishing this one and then for sending a copy my way in exchange for my honest thoughts - which are honestly quite positive. I always want the new books, and the old ones I don't have. I love Tiger Tales. I have a feeling I will continue to collect them long after my children outgrow them! These two titles look very sweet and delightful. I was pleasantly surprised by TT with such a sweet book honoring the Creator, too!